The best way to learn about alpacas is to come see them in person. That's how we learned - by hanging out at different ranches and asking lots of questions. So consider yourself invited. We'd love to have you come visit our alpacas and learn for yourself. There's no better way to get an education. Alpacas are long-necked fur-bearing creatures raised for their warm and luxurious fleece. Members of the camel family, they come from South America where they have existed for thousands of years. Believed to be among the first animals ever domesticated by man, they have been bred and raised for the past six thousand years by the Incas and their descendants. Residing high in the Alti Plano, the cold and dry plains far up in the Andes Mountains of Peru, Chile and Bolivia, the alpacas have adapted to the cold weather at fourteen thousand feet elevation. Which helps to explain why their fur is so thick and warm. Alpacas are sheared once a year, like sheep. Shearing usually occurs in late spring, giving the alpacas time to regrow their fleece before the next winter while also keeping them cooler during the hot summer months. The sheared fiber is then processed in mills or by hand to create high-end woven products including clothing, blankets and household goods. Alpaca fiber is warmer than wool, softer than wool, lighter than wool, stronger than wool, not itchey like wool, contains no lanolin, and is hypo-alergenic. As soft as cashmere but more durable. Very strong, yet very soft. A truly luxurious fiber. Alpaca fiber comes in many natural colors. There are twenty-two distinct shades of whites, greys, browns and blacks. These colors will never fade, as they are built into the fiber at the cellular level. (The same way that your own hair fades very little if you stand around in the sun.) In addition, white fleece can become whatever color one desires, as the fibers may be dyed to any shade imaginable. How long have alpacas been in this country? Alpacas were first imported into the United States in 1984. For more than twenty years, breeders have been carefully making choices on which animals to breed in order to continually improve the North American herd. In 1998 it was decided that there was sufficient breeding stock in the United States to be able to close off further importation from South America. Currently the only animals able to be registered in this country are those that have been born here. Registration is an important part of alpaca ownership. Each North American alpaca is registered with the Alpaca Registry (known as ARI). A blood sample is tested by DNA analysis in order to prove the precise parentage of every animal. Registration papers will show the entire family tree of each alpaca, back as far as possible to the first imported relatives. So the ancestry of each animal is a proven and known entity. What are the two kinds of alpacas? Alpacas come in two flavors, each with a funny South American name: Huacayas and Suris. These are based on the way the fiber grows on the animal. The Huacaya (pronounced "wha-KAI-uh") has a fuzzy teddy-bear-like coat with tightly bunched curls that makes for a somewhat fluffy appearance. The Suri (pronounced "SIR-ree") has lengthy flowing fiber that hangs down the side in long silky strings, the locks appearing somewhat like Rastafarian dreadlocks. Huacayas and Suris both come in all the many colors that alpacas come in. The primary difference is the appearance of the fiber. Because the fiber structure is so different, alpaca shows hold separate judging for the two alpaca types. Is one kind better than the other? No, It just comes down to personal preference as to which kind of alpaca one finds appealing. Thus far, Silver Thunder Alpacas has chosen to concentrate solely on Huacaya alpacas. Alpacas come from South America where they live in the dry high country called the Alti Plano at elevations up to 14,000 feet. Alpacas are members of the Camel family, what veterinarians call "camelids". Other South American Camelids include the Llama, the Guanaco and the Vicuna. There are six million alpacas in South America, three million in Peru alone. Mostly white. They breed for white to make it easier to dye the fiber later with bright colors. In North America alpaca breeders often breed for colored alpacas because hand spinners, weavers and fiber artists prefer the many beautiful shades of fiber available in natural colors. In the United States there are currently more than 100,000 registered alpacas living on 4,000 farms and ranches that are found throughout all fifty states. Nearly all alpacas in the United States are registered. A blood sample from each alpaca is sent in for DNA testing to verify correct parentage and ownership. Every registered alpaca has registration papers showing it's entire geneology all the way back to the point of importation into the United States. Because every alpaca is registered, a stolen alpaca in not sellable, as an alpaca without registration papers has no value. Also, a stolen alpaca is easily traceable as it's DNA-tested blood becomes it's "license plate" to trace ownership and prosecute theft. Alpaca fiber is warmer than wool, softer than wool, lighter than wool, stronger than wool, not itchey like wool, and non-alergenic. A truly luxurious fiber. 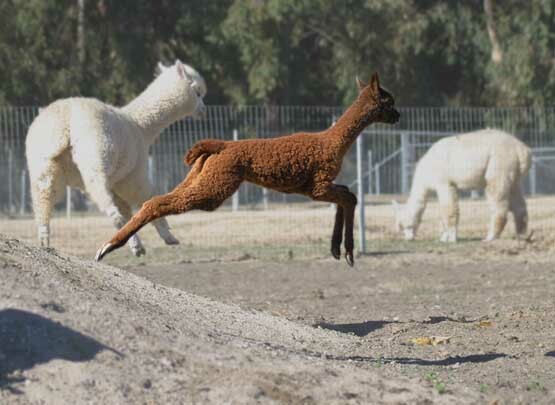 Baby alpacas, called crias ("CREE-uhz"), love to run and jump and play. That's our Gingerbread as a cria in the photo at the top of this page. It takes nearly a whole year to make a baby. The gestation period for alpacas is 11 1/2 months. Alpacas are herd animals and depend on the group for their safety and contentment. If one rolls for a dustbath, others will follow. If one goes to the poop-pile (they all go in one place), others will get in line too. Alpacas are very curious animals, always inquisitive about the world around them. They will lean over the fence to inspect something new, such as a new cria in the next pen. Curious alpacas will lift their heads to inspect an approaching car coming down the driveway and (at least at our farm) come to the fence hoping for a baby-carrot snack from the new visitors. Alpacas will make an alert sound if they sense danger. (It sounds like a cross between a donkey and a parrot. A very distinctive and loud "eee - eee - eeeeeh" sound.) One alpaca will sound the alert, and the whole herd will look up to see what they are alerting at. The perceived threat might not be actually dangerous, sometimes its just something new that they haven't seen before. Always adding to this list of short alpaca facts. Please stay tuned. Click here to return to the top of this page: Alpaca Facts.